CoolSculpting San Ramon provider Elite Freeze® is located right next to San Ramon. CoolSculpting patients from San Ramon have been coming to Elite Freeze® since their establishment. Keep reading to find out why San Ramon is such a great city, why CoolSculpting is such a great fat-loss procedure, and why CoolSculpting San Ramon patients have been choosing Elite Freeze® again and again. San Ramon (Spanish meaning: Saint Raymond) is the fourth largest city in the Contra Costa County, next to Richmond, Concord, and Antioch. It is the headquarters of Chevron Corporation as well as west coast AT&T. It is the host to the Art and Wind festival every Memorial Day, the Fourth of July Picnic as well as the Primo’s Run for Education in October. San Ramon is known for it’s beautiful skyline, which includes Mount Diablo and Las Trampas Regional Wilderness as well as smaller Bishop Ranch Regional Preserve. The city is primarily urban and residential but surrounded by grasslands and orchards. San Ramon is a wonderful place to live and visit. 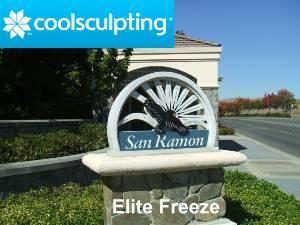 CoolSculpting San Ramon provider Elite Freeze® is located in Danville, California (right next to San Ramon). CoolSculpting patients from San Ramon enjoy their journey through the highway 680 corridor to Elite Freeze®’s headquarters in Danville where they can experience the CoolSculpting procedure with ease. The people of San Ramon are most watchful of their lives and hold a non-invasive procedure like CoolSculpting in high esteem! CoolSculpting San Ramon patients have been enjoying the Elite Freeze® experience since the conception of Elite Freeze®. Especially because of their spotless reputation, award winning and board certified doctors, and their precision-like operation of the many treatments they perform. CoolSculpting is the new procedure which is FDA approved and involves merely freezing your fat away. This procedure is first of all non-invasive. Secondly, it requires no anesthesia. And thirdly, patients have no post-procedure down time. It is a wonderful, cool, and an innovative way to get rid of that stubborn fat with it’s annoying bulges and bumps. Simply stated, the process involves 1. the targeting and cooling of the unwanted fat cells, 2. the fat cells in the targeted area die and 3. your body naturally metabolizes the dead fat cells out of the body – leaving behind a brand new looking you! Since the surrounding muscle and other tissue is more resilient than the fat cells, only the fat cells die off , leaving the other tissue unharmed. So, what are you waiting for? Contact your number one CoolSculpting San Ramon provider, Elite Freeze®! Why go with any other fat-loss procedure? The best is simple, it’s CoolSculpting! San Ramon residents and visitors! Did you like what you just read? Are you ready to schedule a consultation with CoolSculpting? Contact the CoolSculpting San Ramon local providers Elite Freeze® today. We are positive that you will love your experience with us and we know you will love the results of CoolSculpting.